Greetings, o counterculture hippies of 1968! I come to you from the second decade of the 21st century to give you hope. Those visions in your head about the democratization of mass media are not the side effects of excessive marijuana use: they’re the actual future. Your constant documenting of your present using the video technology of your day – to our sophisticated eyes, the deeply primitive Sony CV-2400 PortaPak – will not disappear into the vacuum of historical irrelevance. Rather, your actions presage a radical rethinking of the role of the personal video log (or, vlog) that we all take for granted now, thanks to something we call YouTube. Don’t worry, as most of you will make it to our time and see this future for yourselves. So take heart, keep up the good work, and peace out. In case you, o filmgoer of 2016, were unaware of when the dawn of the personal video camera began, I give you Here Come the Videofreex, a fascinating new documentary from filmmakers Jon Nealon (Goodbye Hungaria) and Jenny Raskin (On Hostile Ground). Both Nealon and Raskin normally work in other capacities (he as an editor and she as a producer), but here they combine their talents to take us on a wild ride through the early days of portable video cameras. Cut together almost entirely from footage shot by its subjects – starting in 1968 and going up to the mid-1970s – with modern-day talking-head interviews of the survivors, the movie is not only enormously entertaining, but precious as a vital historical record of the foundations of our current media age. “The Videofreex,” as they called themselves, were a collective of young twenty-somethings, self-identified members of the 1960s counterculture who saw an opportunity, with the new video cameras of that time, to document the ever-changing world around them. Their numbers included important future film and video artists like Skip Blumberg and Nancy Cain, among others, who tried to take on the established forms of media storytelling by offering up an alternate point of view. Some of their subjects included Fred Hampton, of the Black Panthers, as well as Abbie Hoffman and his fellow Yippies. Even if one has no interest in the development of video technology (and if not, then why not? 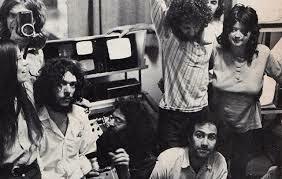 ), Here Comes the Videofreex serves as a marvelous testament of the radical movements of that era. Perhaps the most surprising development in the story of the Videofreex comes after their failed attempt to create content for CBS. Producer Don West thought it would be a good idea to include the youth voice in the network’s programming, but when the time came to broadcast the material, neither the Videofreex nor their producer could compromise on what to show. Unwilling to accept that no one would ever see their footage, the video filmmakers took off for upstate New York – more precisely, to Lanesville – where they set up shop (and house) in a ramshackle mansion that served as their base of operations for a number of years. There, after some initial resistance from the locals, they created their own pirate TV network, broadcasting pieces about, and for, Lanesville residents. Seeing the long-haired hippies and their more socially conservative neighbors living and working in peaceful harmony – at the height of anger between the two groups over the Vietnam War – gives one hope for the human race. After a successful 2015 film-festival run, Here Comes the Videofreex is now set to come out in limited release on March 9. As you look for showtimes on your smartphone, then hold that same device up to Instagram or Snapchat your latest inspiration, keep in mind the role that those who came before you played in the development of the art and technology of the device in your hand. And then go see the movie, and marvel at what these pioneers accomplished.